The Equine Surveillance Network links the diverse equine community to encourage and support integrated and whole-of-system equine health surveillance. It ensures timely information of equine disease occurrence is available to help inform better decisions to protect the health and well-being of horses and humans. Effective and responsive equine health surveillance safeguards the prosperity of Canada’s equine industry and enables the movement and continuance of trade. The Equine Surveillance Network is part of the Canadian Animal Health Surveillance System (CAHSS), which connects animal health, public health and wildlife health experts from Canada’s animal sectors. In addition to the Equine Surveillance Network, CAHSS member networks include poultry, swine, aquatic, and dairy cattle. CAHSS members work on diseases and issues of concern, including reportable and zoonotic diseases, production limiting diseases and antimicrobial use surveillance. History: Presented with hind end ataxia of 5 days duration, no improvement with anti-inflammatory treatment x 2 days. High antibody titre as per EHV1/4 ELISA, negative PCR. 6 other horses on premises, all tested negative on PCR. None of the horses have been moved off the premises since the diagnosis was made; however, the positive horse was present at a roping/rodeo event in Alberta just prior to diagnosis. Exact event is unknown (according to https://www.avenuecalgary.com/Things-to-Do/Small-Town-Summer-Rodeos-Alberta/, possible events include Wainwright Stampede, Guy Weadick Days (High River), and Sundre Pro Rodeo). The Ontario Ministry of Agriculture, Food and Rural Affairs (OMAFRA) was notified of two confirmed cases of Eastern Equine Encephalitis (EEE) in Haldimand County, ON. Both horses, from separate farms, were unvaccinated for EEE and had no history of travel. They were euthanized following the sudden onset and progression of neurological signs. Labaratory diagnostic testing confirmed infection with EEE virus. Private veterinarians have confirmed that three more horses have demonstrated acute onset of neurological disease within a 5 km radius of these two horses and two have been euthanized. Saskatchewan West Nile Virus cases updated. Two more cases of EEE from the Regional Municipality of Niagara were reported to the Ontario Ministry of Agriculture, Food and Rural Affairs on September 12, 2018. Both horses were unvaccinated and had no travel history. One horse is recovering from depression and ataxia with supportive treatment. The other horse was euthanized following the development of sudden and severe neurological signs. The total number of EEE cases for 2018 is ten. WNV The Ontario Ministry of Agriculture, Food and Rural Affairs received confirmation on September 12, 2018 that a 2 year old unvaccinated filly from Essex County tested positive for West Nile virus. She became depressed, unsteady on her feet and had a temperature of 102 F. She is gradually responding to treatment. This is the second confirmed case of WNV infection in 2018. On November 2, 2018, a positive EIA result was confirmed by the CFIA’s national reference laboratory for a horse on a premises in the municipal district of Bonnyville, Alberta. The horse had been sampled by an accredited veterinarian to comply with U.S. import conditions. No clinical signs of disease were noted at the time of sampling. A CFIA investigation is underway and as per program policy, a quarantine has been placed on the infected animal and its on-premises contact animals. Initial reports indicate that there are several equines on the affected premises. The quarantine will remain until all disease response activities have been completed, including follow-up testing and ordering the destruction of positive cases. Trace-out activities may require the CFIA to undertake actions at additional premises as outlined in the current program policy. A map of cases can be found on the CFIA website. On Nov. 21, 2018, a positive EIA result was confirmed by the CFIA’s national reference laboratory for a horse on a premises in the County of Athabasca, Alberta. The horse had been sampled by an accredited veterinarian to comply with U.S. import conditions. No clinical signs of disease were noted at the time of sampling. A CFIA investigation is underway and as per program policy, a quarantine has been placed on the infected animal and its on-premises contact animals. Initial reports indicate there are several equines on the affected premises. The quarantine will remain until all disease response activities have been completed, including follow-up testing and ordering the destruction of positive cases. Trace-out activities may require the CFIA to undertake actions at additional premises as outlined in the current program policy. More details on EIA may be found on the CFIA website. On September 29, 2018, a positive EIA result was confirmed by the CFIA’s national reference laboratory for a horse from a premises in the municipal district of Bonnyville, Alberta. The horse had been sampled by an accredited veterinarian due to potential exposure to EIA. At the time, the animal was exhibiting clinical signs compatible with EIA infection. A CFIA investigation is underway and as per program policy, a quarantine has been placed on the infected animal and its on-premises contact animals. The quarantine will remain until all disease response activities have been completed, including follow-up testing and ordering the destruction of positive cases. Trace-out activities may require the CFIA to undertake actions at additional premises as outlined in the current program policy. More information on EIA can be found on the CFIA website. An Equine Infectious Anemia (EIA)-affected premises has been identified in the province of British Columbia. On December 7, 2018, positive EIA results were confirmed by the CFIA’s national reference laboratory for two horses on a premises in Cariboo Sub. B, British Columbia. The horses had been sampled by an accredited veterinarian at the owner’s request as exposure to EIA was suspected. No clinical signs of disease were noted at the time of sampling. A CFIA investigation is underway and as per program policy, a quarantine has been placed on the infected animals and their on-premises contact animals. The quarantine will remain until all disease response activities have been completed, including follow-up testing and ordering the destruction of positive cases. Trace-out activities may require the CFIA to undertake actions at additional premises as outlined in the current program policy. A map of cases can be found on the CFIA website. A veterinarian from the Provincial Veterinary Service who practices in the western half on the province of New Brunswick was called on November 5th to see a horse off feed and swelling of the right parotid area. The horse was cultured positive for Strept. equi equi 4 days later. This horse was euthanized for other health reasons. The premise was put under quarantine on November 5th as strangles was suspected with the clinical signs. 3 other horses on the farm were exposed to the positive case. 1 horse (a pony) showed clinical signs 8 days later and was cultured positive. The 2 remaining horses on the farm were also sampled and 1 out of the 2 horses also cultured positive but both showed no clinical signs. Currently the 2 horses have not shown clinical signs and the pony has made a full recovery. The farm continues to be under quarantine and serial nasal swabs are planned before the quarantine is lifted. 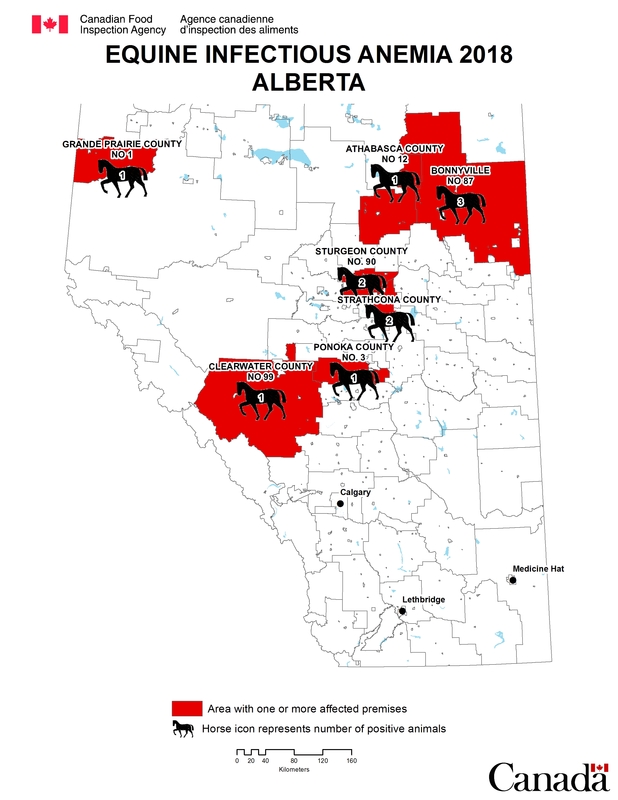 An Equine Infectious Anemia (EIA)-affected premises has been identified in the province of Alberta. communications with the owners or persons directly involved in the case, as outlined in the current EIA program policy. On January 11, 2019, a positive EIA result was confirmed by the CFIA’s national reference laboratory for a horse on a premises in the municipal district of Bonnyville, Alberta. The horse had been sampled by an accredited veterinarian at the owner’s request after it had been purchased from an auction mart. No clinical signs of disease were noted at the time of sampling. A CFIA investigation is underway and as per program policy, a quarantine has been placed on the infected animal and its onpremises contact animals. The quarantine will remain until all disease response activities have been completed, including follow-up testing and ordering the destruction of positive cases. On April 2, 2019 the Ontario Ministry of Agriculture, Food and Rural Affairs (OMAFRA) was notified of a confirmed case of equine herpes myeloencephalopathy (EHM) due to equine herpes virus-1 (EHV-1) at a facility with both competition and resident horses in the Regional Municipality of York. An unvaccinated senior gelding was euthanized after developing sudden and severe neurological signs. The facility owner’s veterinarian is advising the owner on movement restrictions and biosecurity. A second horse, which had been stabled at the same facility for a short period of time prior to returning to the District of Cochrane, has since developed intermittent fevers and has also tested positive for EHV-1. The owner of the second affected facility has placed that premises under a voluntary quarantine. In Ontario, EHV-1 infection is immediately notifiable by laboratories to OMAFRA under the Animal Health Act. Attending veterinarians concerned about potential cases of EHV-1 infection may contact an OMAFRA veterinarian through the Agricultural Information Contact Centre at 1-877-424-1300. More details can be found in the following document from OMAFRA. On January 18, 2019 the Ontario Ministry of Agriculture, Food and Rural Affairs (OMAFRA) was notified of two cases of equine herpes viral abortion caused by equine herpesvirus-1 (EHV-1) at a farm in Haldimand County. The two mares aborted during their 9th and 10th month of pregnancy. One week prior to the abortions, two horses on the same farm suddenly developed neurological signs consistent with the neurological form of EHV-1 infection, also known as equine herpes myeloencephalopathy (EHM). These horses were euthanized and no further diagnostic testing was performed. The farm owner has voluntarily placed the premises under quarantine to reduce the risk of disease transmission. In Ontario EHV-1 infection is immediately notifiable by laboratories to OMAFRA under the Animal Health Act. Attending veterinarians concerned about cases of equine herpesvirus-1 infection may contact an OMAFRA veterinarian through the Agricultural Information Contact Centre at 1-877-424-1300. For further information please see the OMAFRA Website (English) or OMAFRA Website (French). A PDF document of the information is available to download. An Equine Infectious Anemia (EIA) affected premises has been identified in the province of Alberta. On February 6, 2019, a positive EIA result was confirmed by the CFIA’s national reference laboratory for a horse located on a premises in Red Deer County, Alberta. The horse had been sampled by the CFIA to comply with export conditions and no clinical signs of the disease were reported at the time of sampling. A CFIA investigation is currently underway and as per program policy, a quarantine has been placed on the infected animal and its on-premises contact animals. Initial reports indicate that there are several equines on the premises. The quarantine will remain until all disease response activities have been completed, including follow-up testing and ordering the destruction of positive cases. Trace-out activities may require the CFIA to undertake actions at additional premises as outlined in the current policy. On February 22, 2019, positive EIA results were confirmed by the CFIA’s national reference laboratory for four horses located on a premises in the rural municipality of Meadow Lake, Saskatchewan. The horses were epidemiologically linked to a previously identified case in Alberta, and were sampled by the CFIA as part of an ongoing disease investigation. An additional positive result was reported on February 26, 2019, for an epidemiologically linked animal, which was exhibiting clinical signs of disease. All of the infected horses have the same owner, but one animal currently resides on a separate premises. As per program policy, a quarantine has been placed on the infected animals and the on-premises contact animals. The quarantine will remain until all disease response activities have been completed, including follow-up testing and ordering the destruction of positive cases. Trace-out activities may require the CFIA to undertake actions at additional premises as outlined in the current policy. Le Réseau équin du MAPAQ a été informée de la confirmation d’un cas de myéloencéphalopathie à herpèsvirus équin (HVE-1) chez un cheval dans la région Chaudières-Appalaches le 18 février 2019. Le 15 février la jument a présenté une asthénie sévère qui a évolué très rapidement vers un décubitus puis elle a été euthanasiée le 17 février. Afin de limiter la propagation de cet agent pathogène, un suivi vétérinaire régulier et la mise en place d'une quarantaine volontaire associés à des mesures de biosécurité rehaussées sont actuellement mis en œuvre dans l’écurie touchée. Un retraçage des chevaux introduits dans l’écurie a été fait. Aucun déplacement de cheval à partir de l’écurie n’a été effectué et n’est prévu. On February 18, 2019 the MAPAQ equine network has reported confirmation of a case of Equine Herpesvirus Myeloencephalopathy (EHV-1) in a horse in Chaudières-Appalaches. On February 15, a mare presented with severe weakness and she soon was unable to stand, she was euthanized on February 17. In order to limit the spread of this pathogen, a voluntary quarantine with enhanced biosecurity measures has been implemented on the affected premises; the animals at the stable are undergoing regular veterinary monitoring. All introductions to the farm have been tracked, and no movements of animals from the stable have occurred or are planned. An Equine Infectious Anemia (EIA) affected premises has been identified in the province of Saskatchewan. On March 18, 2019, a positive EIA result was confirmed by the CFIA’s national reference laboratory for a horse located on a premises in the rural municipality of Big River, Saskatchewan.The horse had been sampled by an accredited veterinarian at the owner’s request after they became aware of a potential epidemiological link to a recently identified EIA-affected premises. No clinical signs of disease were noted at the time of sampling. As per program policy, a quarantine has been placed on the infected horse and its on premises contact animals. The quarantine will remain until all disease response activities have been completed, including follow-up testing and ordering the destruction of positive cases. Trace-out activities may require the CFIA to undertake actions at additional premises as outlined in the current policy. Please see the CFIA website for a map of cases. On March 13th, a provincial veterinarian was called out to examine a horse with an abscess. Due to the location of abscess and clinical signs, the veterinarian was suspicious of strangles and swabbed the abscess. Laboratory confirmation on March 19th revealed Strep. equi equi (strangles). There are several other horses on the premise. This latest case of strangles is in the south-eastern part of the province and not related to other cases reported. A quarantine of the premise and horses has been made along with visitor restrictions. These animals are being monitored and are being provided with follow-up care. On March 29, 2019, positive EIA results were confirmed by the CFIA’s national reference laboratory for two horses located on a premises in Clear Hills County, Alberta. The horses had been sampled by an accredited veterinarian to comply with U.S. import conditions. No clinical signs of disease were noted at the time of sampling. A CFIA investigation is underway and as per program policy, a quarantine has been placed on the infected horses and their on-premises contact animals. Initial reports indicate there are several equines on the affected premises. The quarantine will remain until all disease response activities have been completed, including follow-up testing and ordering the destruction of positive cases. Trace-out activities may require the CFIA to undertake actions at additional premises as outlined in the current policy. On April 4, 2019, a positive EIA result was confirmed by the CFIA’s national reference laboratory for a horse located on a premises in the rural municipality of Lakeview, Saskatchewan. Saskatchewan: Abortions occurred in two mares (9 yr old and 14 yr old), from a group of 22 pregnant mares, described as an ‘open’ herd. Mares were not vaccinated. There is no respiratory disease present in this group of mares. One of the aborted fetuses tested positive for EHV-1 by PCR. The attending vet is overseeing and managing the case. Saskatchewan Agriculture monitors the occurrence of EHV-1 in the province, but does not respond to positive cases.